Since I'm doing summery posts for MoFo, it seems like I probably shouldn't let a whole month go by without talking about vegan ice cream! I don't actually eat loads of ice cream, but when I'm in the mood, it can really hit the spot... especially on a hot summer day. Sometime last year, someone on the PPK mentioned that a friend of hers was starting an ice cream company and was looking for Bay Area bloggers who would be willing to review it. Naturally, I got right on top of that. Back then, the nice guys at Mr Dewie's were just starting out with almond-based ice creams, and they sent me some coupons, but I couldn't find their stuff in Santa Cruz... so it remained an unrealized dream. All this time later, they switched from almonds to cashews, got some seriously rave reviews from every single person at the Expo West, and then sent me an email asking if I'd be up for trying again. Heck yeah! At my local Whole Foods, they carried three flavors: Coffee, Caramel Almond Crunch, and Chocolate. I had two coupons in my hand, so I had some important decisions to make. I knew I wanted to try the coffee flavor, and in the end, I decided that I can get chocolate vegan ice cream without too much hassle, so I picked the Caramel Almond Crunch. First things first. The cashew-base on this ice cream makes it so unbelievably rich! It's super thick and creamy. 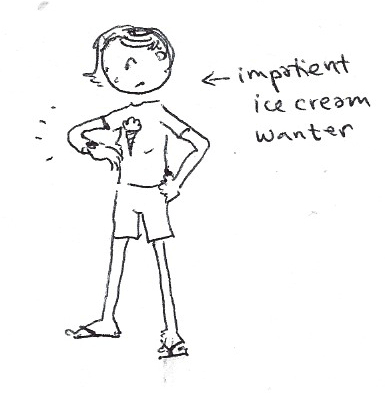 On the package, it suggests letting the ice cream warm at room temperature for a few minutes, until it is more easily scoopable. I'm sure that's a good idea, but damn is it hard to wait! Next up. Coffee Ice Cream. Huzzah!!! 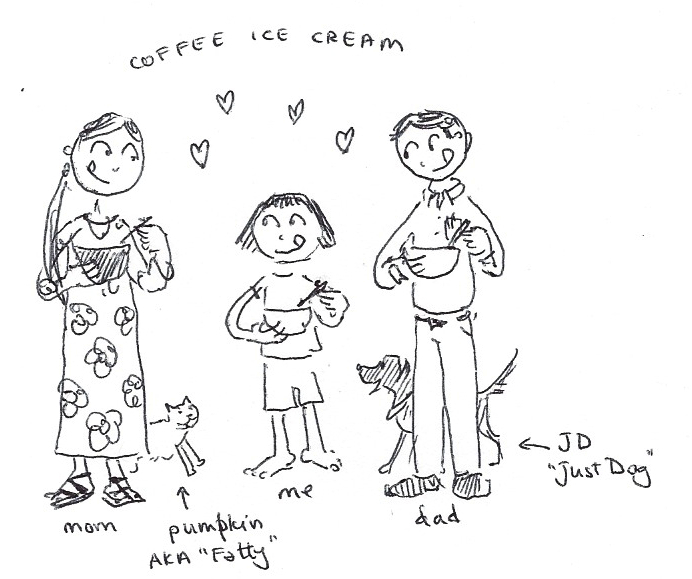 Growing up, we didn't eat many sweeties in my house, but my parents were big fans of coffee ice cream and I developed a special affection for coffee ice cream long before I every enjoyed an actual cup of coffee. I have really, really missed a good, flavorful vegan coffee ice cream option ~ and I need not lament any longer. I really loved this stuff so much. I still have about half my tub left and I like to sneak over to the freezer and savor just a few nibbles at a time. I am seriously cherishing every coffee-ful bite. I love crunchy bits in my ice cream, so it's not really a surprise that I really liked the Caramel Almond Crunch too. Even after being so impressed with their coffee flavor, the richness of the caramel flavor was a such a surprise, and there are definitely plenty roasted almond chunks in there to fit the bill and live up to the name. There are a lot of vegan ice cream options these days, and I definitely think Mr. Dewie's deserves its place in the freezer. It's much more rich and decadent than many of the other vegan ice creams I've tried, and I love their flavors (they also have a Chocolate Orange flavor that I have yet to try). The cartons are a bit pricey (about $7) ~ but I think it's worth it for special occasions and dinner parties. p.s. 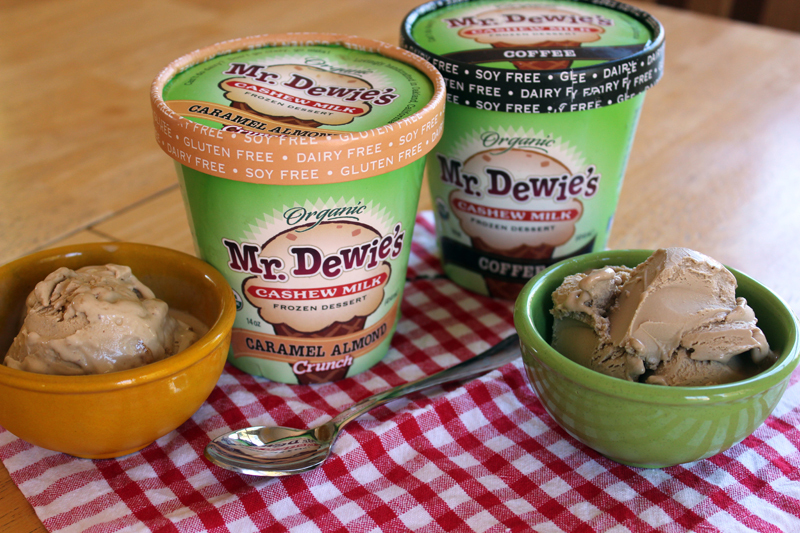 The Spooky Vegan also did a review, and tried all four Mr. Dewies flavors! I love their inventive and fun flavours, new ice cream companies pop up here occasionally and they always do the same thing, chocolate, vanilla and strawberry! Why?! So boring! I mean sure, I love chocolate but there are already great options for chocolate here! I want coffee too!! So many different ice creams in the world, so few of them available in Australia! I would love to try some cashew ice cream, it sounds like it would be amazing. Sounds like I'm going to have to give them a try. I love ice cream!!!! Mmm, I love coffee ice cream too. I don't think I've had a cashew ice cream that I've loved but maybe I should try more! 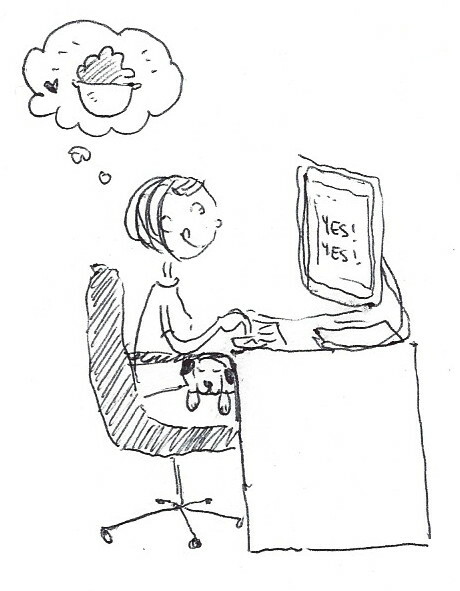 Your illustrations are the cutest. I love that there are always cats and dogs in the background. Oh my goodness. Cashews are possibly my favorite food. I hope Mr. Dewie's makes it's way to the midwest sometime soon!